The future of industrial production will include working with assistants that are modular, versatile and, above all else, mobile. 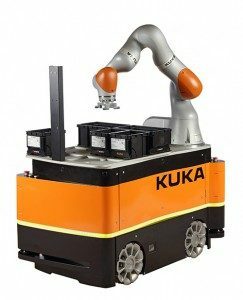 KUKA Robotics has developed a new, fully-automated, autonomous solution that combines a lightweight robot and a mobile platform – the KMR iiwa. KUKA’s long-standing partnership with SICK played an integral role in the process, thanks to safety laser scanners that provide both a protective function and navigational support in the KMR iiwa. This enables the worker to interact directly with the autonomous guided vehicles (AGV). No physical guards are required, making this system genuinely true to the spirit of creating sustainable flexibility in production. The ability of the AGV to move independently through factory halls and transport goods represents the future of logistic processes in production. For KUKA, the future is already here. In its production workflow, the KMR iiwa picks boxes containing materials and delivers them to the production line when they are needed. It shares the routes it travels, as well as the shelving areas, with tugger trains and workers. KUKA’s new materials are ordered automatically through its ERP systems and suppliers – a practice that lines up with the principles of Industry 4.0 – and are then distributed among workstations by the KMR iiwa, entirely autonomously. However, the company’s focus is on more than just the production skills the robot offers in house. For some years now, KUKA has already been successfully integrating SICK solutions into its OmniMove heavy-duty, mobile platform. 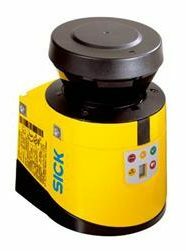 These AGVs are able to move nearly 200,000 pounds and work on the basis of interaction between the S3000 safety laser scanner from SICK and KUKA navigation software. When the KMR iiwa was being developed, it was essential to find exactly the right technology for the job. KUKA wanted a technology partner with excellent application knowledge and in-depth cooperation, and SICK was chosen. Using a pair of more compact S300 safety laser scanners,he 270° scanning angle of these devices ensures all-around surveillance. Multiple protective fields that offer flexible configuration options are especially important in applications that use compact, mobile robots – and the 16 freely configurable protective fields offered by the S300 allow flexible adaptation to a range of traveling situations and environmental conditions. Mobile robotics also require vehicles that are as compact and rugged as possible, and have to consider the amount of energy that components consume. Its small size means that the S300 offers the right technical credentials in this respect too, and this made it one of the key building blocks in creating a solution to suit KUKA’s needs. So how does autonomous navigation in the KMR iiwa work? 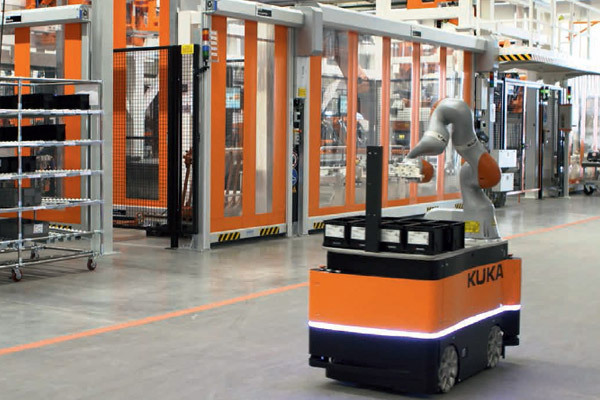 To achieve this, the KUKA navigation software uses information including data supplied by the SICK safety laser scanner to maneuver the AGVs. This means that the S300 provides more than just straightforward protection. One of the most significant challenges facing mobile robotics is how to design systems in a way that accommodates what the applicable standards specify: for example, EN ISO 10218 Parts 1 and 2. The technical specifications of ISO/TS 15066 also apply to collaborative systems in particular. In addition to system design requirements, an individual risk assessment conforming to EN ISO 12100 must be carried out for each KMR iiwa application. This is an all-encompassing risk analysis that sees KUKA working in close collaboration with customers and/or system integrators. The intelligent factory concept envisions connecting individual production elements together during production. This requires the data that is captured, evaluated, and transmitted by sensors to be reliable. Maintaining transparency at all stages of the production and logistics chain is crucial for this data. It is not just data networking that is important, however: AGVs like the KMR iiwa provide a link between individual stages of work, especially in automated and networked production environments. They represent a new form of mobility – one that also relies on innovative solutions to protect humans and materials.